↑ Sparks, Daniel (December 11, 2015). "How Mark Zuckerberg made nearly $12 billion in 2015". Business Insider. Retrieved December 11, 2015. ↑ Napach, Bernice (July 26, 2013). 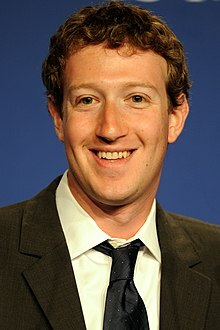 "Facebook Surges and Mark Zuckerberg Pockets $3.8 Billion". Yahoo! Finance. ↑ Hiltzik, Michael (May 20, 2012). "Facebook shareholders are wedded to the whims of Mark Zuckerberg". Los Angeles Times.